Desert Bus is riding again for the 10th year in a row! Desert Bus for Hope is a charity drive that raises money for children’s hospitals and domestic abuse shelters. Every year they stream all week long playing the most boring video game ever created, all while preforming challenges, holding auctions, and giving away prizes! Every year as well, I do the poster for the event chronicling all the wacky stuff that happens on the stream. You should come watch and join in on the fun! And spread the word! Even if you can’t donate, just letting other people know will help! Along with that, I'm making a new NSFW reward tier at $13, where you'll get to see all of my naughtier artwork. Don't worry though, if you're not into that, you'll never have to see it. Also, I've been doing NSFW stuff for years and it won't change my comic work at all. I like keeping Supernormal Step incluseive and safe for everyone to read! Desert Bus 9 is here! Desert Bus for Hope 9 is here! And as usual I'm doing the poster! Desert Bus is a charity drive where people entertain viewers 24/7 to raise money for Child's Play, a charity that donates games and toys to children's hospitals. They'll be going all week so tune in! And I'll be chronicling all the things they do on a poster that I'm drawing throughout the event. Stop by! See the craziness! Spread the word! Donate if you can, but even if you just watch it's a ton of fun! The RPG I did illustrations for (and will continue to do illustrations for) launched it's Kickstarter today! Check it out! And back it if you like what you see! The more stretch goals are reached, the more work I'll get to do for it! Hey folks! I finally get to share what I’ve been working on recently. These are the illustrations I’ve done for a tabletop Roleplaying game called Masks! Later this month a Kickstarter will launch for it to be funded, and once that’s done I’ll be the illustrator of the full book! For those interested in tabletop games, the system is based on the Apocalypse World engine, the same one used for games like Dungeon World. 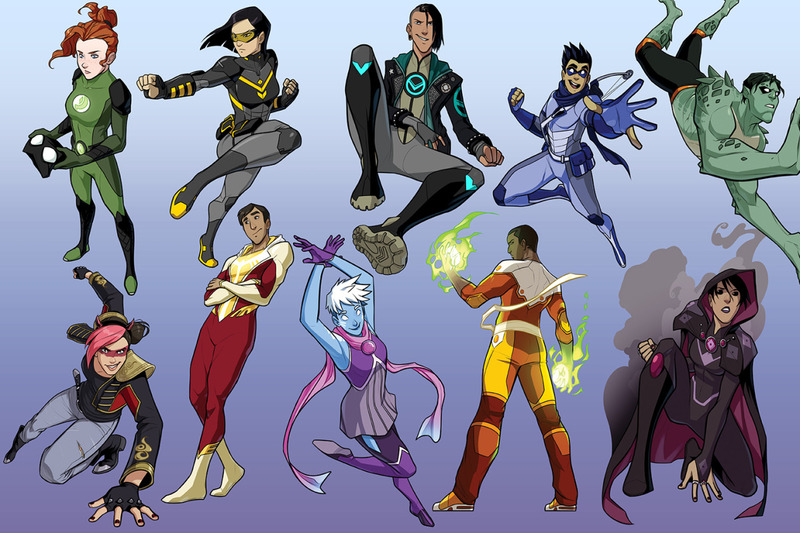 They’ve added to the system to focus on young superheros in coming-of-age stories, like ones seen in Young Justice, Teen Titans, and Young Avengers. It’s been a lot of fun to work on, and I hope it becomes a real thing (especially so I’ll have more work to do!). I’ll let everyone know when the Kickstarter launches, also you should check out their Google+ community for more info right now! That's right more in the store! And both have multiple colors, so you have lots of options! Supernormal Step Merch exists again! Get yours at the Supernormal Step store! Vol 5. and Encore now in the Supernormal Step Store! Finally! It took me way too long to get these done, but Supernormal Step Vol. 5 and the single issue special Encore are in the Store! Both available in print and digital versions! Sorry for the wait on those! It's been a hectic year for me so far. Hopefully the next time I need to get books done I'll be able to get them out more quickly! Looks like there are missing pages throughout the archives since the redesign! The main problem seems to have been apostrophies in the filenames of some pages. So if you're re-reading through and notice some pages missing, let me know! I'll try to fix it. I've fixed a few already and there were some MAJOR pages gone from the archives for the past week. Anyone who read through since the redesign must have been a bit confused! Hopefully if it isn't all fixed yet, it will be soon, sorry for the issues!